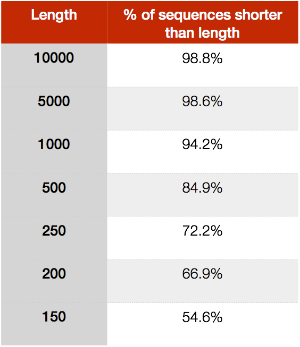 The long tail of the distribution: do people ever really look at their genome assemblies? Since I (somewhat foolishly) volunteered to run CEGMA on behalf of people who were having trouble installing it, I've had the opportunity to look at a lot of genome (and transcriptome) assemblies. Some people get a little bit obsessed by just how many (or how few) core genes are present in their assembly. They also get obsessed by how long (or short) the N50 length of their assembly is. Both steps contribute to increasing the N50 length, though the amount of the increase really depends on the distribution of sequence lengths in the assembly. The second step is clearly bogus, and I added it just to preserve the assembly size. The first step might seem drastic, but is exactly the same sort of step that is performed by many genome assemblers (or by the people post-processing the assembly). If you don't remove short sequences from an assembly, you could end up including a large number of reads that don't overlap with any other read. I.e. it is possible that the shortest contig/scaffold length in an assembly will be the same as whatever the read length of the sequencing technology being used is. If you trim reads for quality, you could potentially end up with contigs/scaffolds with even shorter lengths. How useful is it to include such short sequences in an assembly, and how often do 'assemblers' (the software and/or the people running the assemblers) do this? Well by looking at some of the assemblies that I have run CEGMA against, I can take a look. So about half of the assemblies have unique lengths for their 10 shortest sequences. The remainder represent assemblies that probably either removed all sequences below a certain length (which seems likely with the assembly that had the shortest sequences at 2,000 bp), or which simply included all unassembled reads (six assemblies have an abundance of 100 bp sequences). This begs the question, how useful is it to include all of these short sequences? It's always possible that a 100 bp read that doesn't overlap anything else contains something useful, but probably not. You might see an exon, possibly an intron, and very possibly an entire gene (depending on the species)...but can anyone do much with this information? This is pretty depressing. The vast majority of sequences in this assembly are likely to be too short to be of any use. The reason that this assembly counted among by 'unique' category is because the shortest ten sequences have lengths as follows: 100, 100, 99, 88, 87, 76, 73, 63, 12, and 3 bp. That's right, this assembly includes a sequence that's only three base pairs in length! You can increase the N50 length of your assembly by removing the shortest sequences. This is not cheating — though you should clearly state what cutoff has been used — and should be considered part of the genome assembly process (getting rid of the crap). Please look at your assembly before doing anything with it. On it's own, N50 is not a very useful statistic. Look at the distribution of all sequence lengths (or plot an NG(X) graph). It turned out that this assembly did contain a fair number of core genes and these were almost all located in the 1.2% of sequences that were > 10,000 bp. That 3 bp sequence though, turned out it contained no core genes at all. Shocker!